On the decease of his father in 1682, he succeeded him in his titles and estate; and on the death of Charles II. was one of the privy-council who signed the order, dated at Whitehall, Feb. 6, 1684-5, for proclaiming the duke of York king of England. In that reign he was one of the chief opposers of the abrogation of the test act, which he considered as the strongest fence of the protestant religion. Upon the trial of the seven bishops, he was present in court with several other noblemen; and his brother Heneage, afterwards earl of Aylesford, was of the counsel for those prelates. He was likewise one of the patriots, who, from a true zeal for their religion and their country, often met to concert such advices and advertisements as might be fit for the prince of Orange to know, that he might govern himself by them. When, however, it was secretly proposed to him to invite that prince into England, he felt a conscientious hesitation on the subject, and informed the friends of that measure that he could not personally adopt it, yet would preserve the secret with which they had intrusted him. Upon the prince’s landing in the West, he | was one of those lords who made a last attempt on the obstinacy of the king, by presenting a petition to his majesty, advising him to call a parliament regular and free in all respects, to which he was even for adding, “that the peers who had joined the prince might sit in that free parliament;” but this by the other lords was thought unnecessary. He was afterwards one of the commissioners sent by^ his majesty to treat with the prince. When afterwards the convention was opened, he was the principal manager of the debates in favour of a regent, against those who were for setting up another king; supporting his opinion by many arguments drawn from the English history, and adding a recent instance in Portugal, "where Don Pedro had only the title of regent conferred upon him, while his deposed brother lived. However, he owned it to be a principle grounded on the law and history of England, that obedience and allegiance were due to the king for the time being, even in opposition to one, with whom the right was thought still to remain. 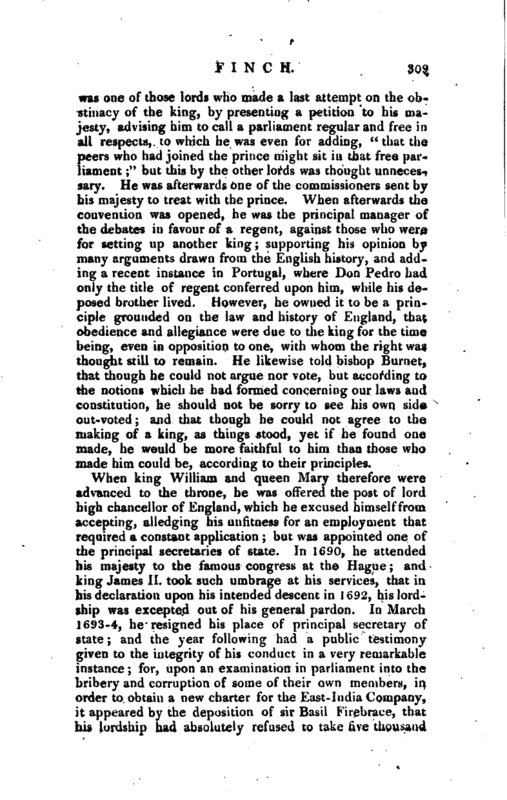 He likewise told bishop Burnet, that though he could not argue nor vote, but according to the notions which he had formed concerning our laws and constitution, he should not be sorry to see his own side out-voted; and that though he could not agree to the making of a king, as things stood, yet if he found one made, he would be more faithful to him than those who made him could be, according to their principles. 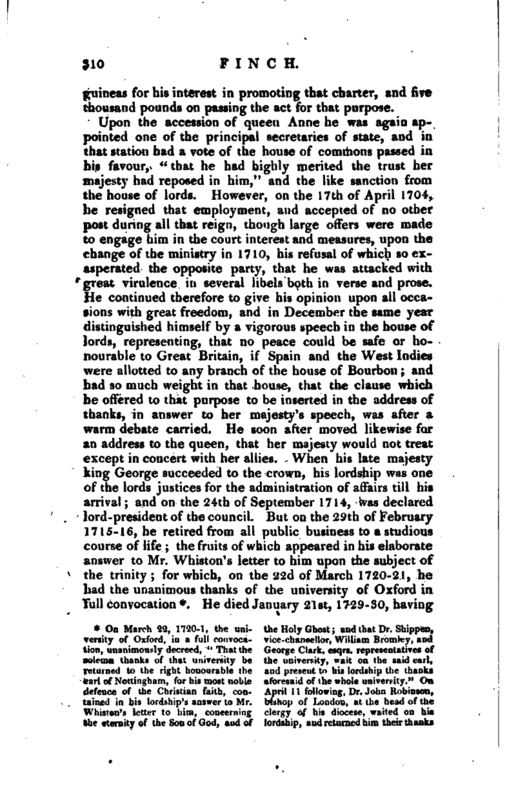 When king William and queen Mary therefore were advanced to the throne, he was offered the post of lord high chancellor of England, which he excused himself from accepting, alledging his unfitness for an employment that required a constant application; but was appointed one of the principal secretaries of state. In 1690, he attended his majesty to the famous congress at the Hague; and Jdng James II. took such umbrage at his services, that in his declaration upon his intended descent in 1692, his lordship was excepted out of his general pardon. In March 1693-4, he resigned his place of principal secretary. 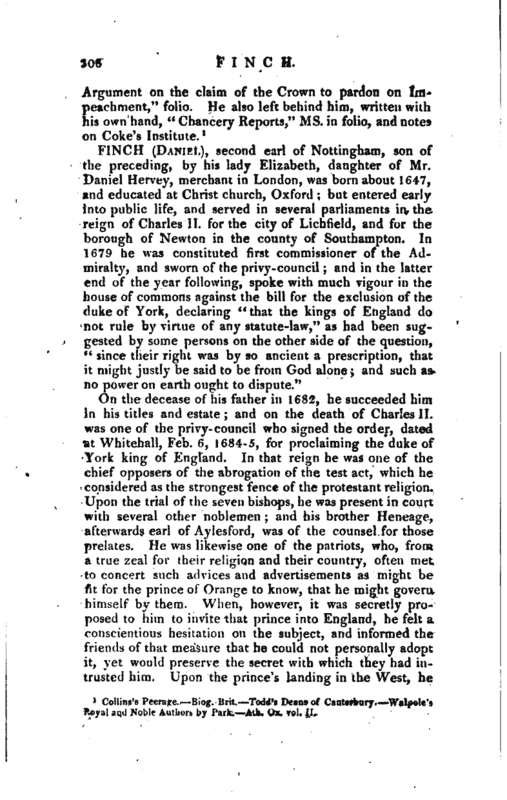 of state; and the year following had a public testimony given to the integrity of his conduct in a very remarkable instance; for, upon an examination in parliament into the bribery and corruption of some of their own members, in order to obtain a new charter for the East-India Company, it appeared by the deposition of sir Basil Firebrace, that his lurdship had absolutely refused to take five thousand | guineas for his interest in promoting that charter, and five thousand pounds on passing the act for that purpose. on the same Account; as also, did the clergry of the diocese of Peterborough, His lordship had before manifested his regard for the private interest of the clergy, having by indenture, Sept. 11, 1702, treelry devised to the vicarage of Greetham, in Rutlandshire^ all the tithes of corn, hay, &c. arising and s^rowhig in Woolfox, in the said parish of Greetham, for an augmentation, of at least 8,/. per annum, to the said vicarage for ever. He died January 21st, 1729-30, having | just before succeeded to the title of earl of Winchelsea, into which that of Nottingham merged. By his first wife, the lady Essex Rich, second daughter and one of the co-heirs of Robert earl of Warwick, he had issue one daughter; and by his second, Anne, only daughter of Christopher lord viscount Hatton,he had five sons and eight daughters. Collins’s Peerage, by sir K. Urydges. Birch’s Lives. —Ath. Ox. vol. II. Walple’s Royal and Noble Authors, hy Park. 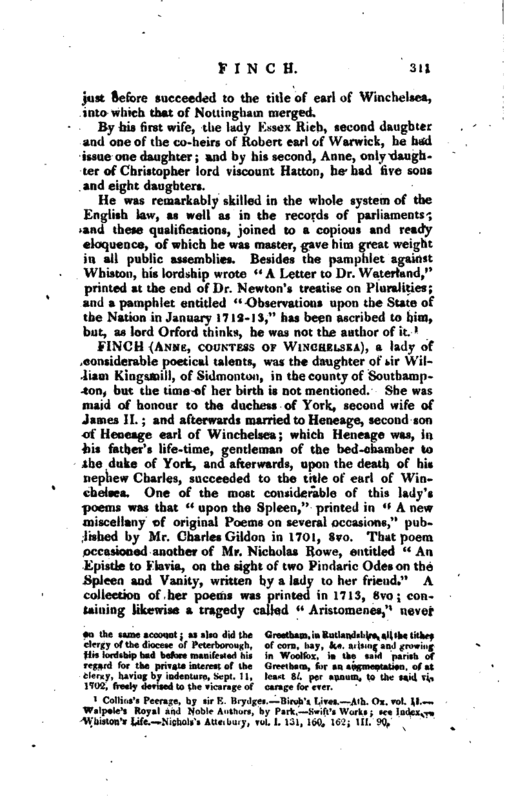 Swift’s Works; see Index.-. Winston’s Life. Nichols’s Atterbury, vol. 1. 131, 160, 16-2; Iit. 9tl.